For the honorific accorded a deacon's wife, see Diakonissa. The ministry of a deaconess is, in modern times, a non-ordained ministry for women in some Protestant churches to provide pastoral care, especially for other women. The term is also applied to some women deacons in the early church. The word comes from a Greek word, diakonos (διάκονος), for "deacon", which means a servant or helper and occurs frequently in the Christian New Testament of the Bible. Deaconesses trace their roots from the time of Jesus Christ through to the 13th century in the West. They existed from the early through the middle Byzantine periods in Constantinople and Jerusalem; the office may also have existed in Western European churches. There is evidence to support the idea that the diaconate including women in the Byzantine Church of the early and middle Byzantine periods was recognized as one of the major orders of clergy. A modern resurgence of the office began among Protestants in Germany in the 1840s and spread through Scandinavia, the Netherlands, Britain and the United States. Lutherans were especially active. The modern movement reached a peak about 1910, then slowly declined as secularization undercut religiosity in Europe and the professionalization of nursing and social work offered better career opportunities for young women. A small movement still exists and its legacy is seen in numerous hospitals. Non-clerical deaconesses should not be confused with women ordained deacons such as in the Anglican churches and the Protestant Church in the Netherlands. The oldest reference to women as deacons occurs in Paul’s letters (c. AD 55–58). Their ministry is mentioned by early Christian writers such as Clement of Alexandria. and Origen. Secular evidence from the early 2nd century confirms this. In a letter Pliny the Younger attests to the role of the women deacons. Pliny refers to "two maid-servants" as deacons whom he tortures to find out more about the Christians. This establishes the existence of the office of the deaconesses in parts of the eastern Roman Empire from the earliest times. Fourth-century Fathers of the Church, such as Epiphanius of Salamis, Basil of Caesarea, John Chrysostom and Gregory of Nyssa accept the ministry of women ordained deacons as a fact. The Didascalia of the Apostles is the earliest document that specifically discusses the role of the male and female deacons more at length. It originated in Aramaic speaking Syria during the 3rd century, but soon spread in Greek and Latin versions. In it the author urges the bishop: "Appoint a woman for the ministry of women. For there are homes to which you cannot send a male deacon to their women, on account of the heathen, but you may send a deaconess ... Also in many other matters the office of a woman deacon is required." The bishop should look on the man who is a deacon as Christ and the woman who is a deacon as the Holy Spirit, denoting their prominent place in the church hierarchy. The women deacons are also mentioned in a passage of the Council of Nicea in 325 which implies their hierarchal, consecrated or ordained status; then more clearly at the Council of Chalcedon of 451 which decreed that women should not be ordained deacons until they were 40 years old. The oldest ordination rite for deaconesses is found in the 5th-century Apostolic Constitutions. It describes the laying on of hands on the woman by the bishop with the calling down of the Holy Spirit for the ministry of the diaconate. A full version of the rite, with rubrics and prayers, has been found in the Barberini Codex of 780 AD. This liturgical manual provides an ordination rite for women as deacons which is virtually identical to the ordination rite for men as deacons. Other ancient manuscripts confirm the same rite. A careful study of the rite has persuaded most modern scholars that the rite was fully a sacrament in present-day terms. Olympias, one of the closest friends and supporters of the Archbishop of Constantinople John Chrysostom, was known as a wealthy and influential deaconess during the 5th century. Justinian's legislation in the mid-6th century regarding clergy throughout his territories in the East and the West mentioned men and women as deacons in parallel. He also included women as deacons among those he regulated for service at the Great Church of Hagia Sophia, listing men and women as deacons together, and later specifying one hundred deacons who were men and forty who were women. Evidence of continuing liturgical and pastoral roles is provided by Constantine Porphyrogenitus' 10th-century manual of ceremonies (De Ceremoniis), which refers to a special area for deaconesses in Hagia Sophia. Paul's earliest clear mention of a woman being a deacon is in his Letter to the Romans 16:1 (AD 58) where he says: "I commend to you our sister Phoebe, who is the deacon of the church at Cenchreae.". The original Greek says: οὖσαν διάκονον, ousan diakonon, being [the] [female] deacon of the church at Cenchreae. Many scholars agree that the phrase denotes "an official title of a permanent ministry", documenting the existence of a diaconate including women. However, the term may refer to her serving in a more generic sense, without having a church ministry. This is the primary meaning, and also how Paul uses the term elsewhere in the Letter to the Romans. Deacons likewise must be serious, not slanderers, but temperate, faithful in all things ... for those who serve well as deacons gain a good standing for themselves and also great confidence in the faith in Christ Jesus. This verse about "the women" appears in the middle of a section that also addresses the men. However, the words regarding "the women" do not seem to refer to the wives of male deacons, but to deacons who are women. The transition is natural in Greek, because the same word διακονοι covers both men and women. To indicate the women, the Greeks would say διάκονοι γυναῖκες [= "deacon women"]. This expression appears in the church legislation of Justinian. This interpretation is also followed by the early Greek Fathers such as John Chrysostom and Theodore of Mopsuestia. It is through this verse that the leading women are reminded of their role in the diaconate and confirmed in their active participation in the offices of the church. Several women deacons are specifically commended who took part in the Jesus movement alongside Jesus. Two of these women are Priscilla and Phoebe of the church in Cenchreae. He describes both of these women as "helpers of many" and "servants of the church whose business in Rome warranted the support of all the saints" (Rom 16:1–2). When Paul mentions Phoebe, "our sister Phoebe [the] ἀδελφήν which means (sister) of the church of Cenchreae", he adds "she has been a helper of many and of myself as well". In describing her role and his in the congregation, Paul uses the Greek verb meaning "to be at the head of, to rule, to direct". In addition, Paul also speaks of other women who were ministers such as Mary, Tryphaena, Typhosa and Persis whom he writes "worked hard in the Lord" and "workers in the Lord" (v. 12). The contribution of these women is described by the same verb, κοπιάω, used to describe "toil" and "labour" (Matthew 11.28; John 4.6). Moreover, Paul uses this verb to describe his own work for the Lord and other apostolic labours. In addition, Mary's labour described as "among you" or "for your benefit" (v. 6) suggest a recognized role of ministry within the church. Probably these women had a ministry with other women, rather than over the whole church, because Paul prohibited women from teaching men in 1 Timothy 2:10-12. Thus they were also excluded from leadership over the congregation, because church leaders had to be able to teach - rather than having a prohibition to teach the congregation (1 Tim 3). Women, serving alongside Paul, thus probably taught other women. Since Paul´s prohibitions only refer to the church, they might have been involved in evangelistic preaching to men and women, as long as they were not part of the church. The church at Philippi is another example of early involvement of women in important parts of church's ministry. In Paul’s letter to the Philippian church, he addresses the three women Euodia, Syntyche and a third, for which he uses the affectionate term, syzugē to mean "mate" (Phil. 4:1–3). Through the Pauline epistles it is clear that deaconesses and other women exercised important roles identified and recognized as central within the office of the church. Two types of monastic women were typically ordained to the diaconate in the early and middle Byzantine period: abbesses and nuns with liturgical functions, as well as the wives of men who were being raised to the episcopacy. There was a strong association of deacons who were women with abbesses starting in the late fourth century or early fifth century in the East, and it occurred in the medieval period in the Latin as well as the Byzantine Church. Principally, these women lived in the eastern part of the Roman Empire, where the office of deaconess was most often found. There is literary evidence of a diaconate including women, particularly in Constantinople, and archaeological evidence of deaconesses in a number of other areas in the Empire, particularly Asia Minor. 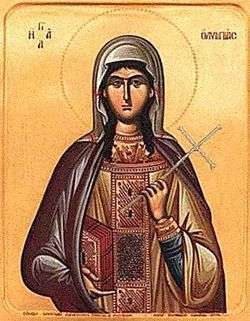 One example of a woman from Constantinople being a deacon during the post-Constantine period was Olympias, a well-educated woman, who after being widowed devoted her life to the church and was ordained a deacon. She supported the church with gifts of land and her wealth which was typical during this period. Macrina, born in 330, the eldest sister of Basil and Gregory of Nyssa, was also a well-known deaconess who founded her own monastic community. Melania born in Rome in 383, also founded monastic communities and provided hospices for pilgrims. Deaconesses, like these wealthy women, were supporters of the church. In many cases they founded religious communities which welcomed all unmarried women, whether virgins or widows. Women who are deacons are often mistaken as being only widows or wives of deacons; and it is sometimes described that they came out of an order of widows. Minor church offices developed about the same time as the diaconate in response to the needs of growing churches. Widows, however, were elderly women of the congregation in need of economic help and social support due to their situation. This concept is mentioned in the first Acts 6:1 and 9:39–41 and 1 Timothy 5. These widows had no specific duties compared to that of the deacons. In the Apostolic Constitutions women who were deacons were recognized as having power over the widows in the church. The widows were cautioned to obey “women deacons with piety, reverence and fear.” In the first four centuries of the church, widows were recognized members of the church who shared some similar functions of a deaconess; yet did not share the same responsibilities or importance. In the Byzantine church women who were deacons had both liturgical and pastoral functions within the church. These women also ministered to other women in a variety of ways, including instructing catechumens, assisting with women’s baptisms and welcoming women into the church services. They also mediated between members of the church, and they cared for the physical, emotional and spiritual needs of the imprisoned and the persecuted. They were sent to women who were housebound due to illness or childbirth. They performed the important sacramental duty of conducting the physical anointing and baptism of women. Ordination to the diaconate was also appropriate for those responsible for the women’s choir, a liturgical duty. Evidence in the Vita Sanctae Macrinae (or Life of St. Macrina) shows that Lampadia was responsible for the women's choir. Some believe that they were also presiders of the Eucharist, but this practice was seen as invalid. It has been argued that some examples of Christian art reflect the leadership roles of women as deacons including administration of the host, teaching, baptizing, caring for the physical needs of the congregation and leading the congregation in prayers. Some depictions of women in early Christian art in various ministerial roles were, arguably, later covered up to depict men. The fresco in the Catacombs of Priscilla has been claimed as one example of a conspiracy to deny women’s involvement in the Eucharist. Another example involves the chapel of St. Zeno in the Church of St. Praxida in Rome. An inscription denoting a woman in the mosaic as, “Episcopa Theodora” was altered by dropping the feminine –ra ending, thereby transforming into a masculine name. Because episcopa is the feminine form of the Greek word for bishop or overseer, the inscription suggests that Theodora was a woman who became a bishop; however, this appellation was also originally used to honour the mother of a bishop. After the 4th century the role of women as deacons changed somewhat in the West. It appeared that the amount of involvement with the community and the focus on individual spirituality did not allow any deacon who was a woman to define her own office. During the rule of Constantine, as Christianity became more institutionalized, leadership roles for women decreased. It was during the fifth and sixth centuries in the western part of the Roman Empire that the role of deaconesses became less favorable. The councils of Orange in 441 and Orléans in 533 directly targeted the role of the deaconesses, forbidding their ordination. By at least the 9th or 10th century, nuns were the only women ordained as deacons. Evidence of diaconal ordination of women in the West is less conclusive from the 9th to the early 12th centuries than for previous eras, although it does exist and certain ceremonials were retained in liturgy books to modern times. In Constantinople and Jerusalem, there is enough of a historical record to indicate that the diaconate including women continued to exist as an ordained order for most if not all of this period. In the Byzantine Church, still at that time in communion with the Western church, the decline of the diaconate which included women began sometime during the iconoclastic period with the vanishing of the ordained order for women in the twelfth century. It is probable the decline started in the late seventh century with the introduction into the Byzantine Church of severe liturgical restrictions on menstruating women. By the eleventh century, the Byzantine Church had developed a theology of ritual impurity associated with menstruation and childbirth. Dionysius of Alexandria and his later successor, Timothy, had similar restriction on women receiving the Eucharist or entering the church during menses. Thus, “the impurity of their menstrual periods dictated their separation from the divine and holy sanctuary." By the end of the medieval period the role of the deacons decreased into mere preparation for priesthood, with only liturgical roles. In the 12th and 13th century, deaconesses had mainly disappeared in the European Christian church and, by the 11th century, were diminishing in the Eastern Mediterranean Christian churches. Even so, there is substantial evidence of their existence throughout the history of Eastern Churches. The deaconess movement was revived in the mid 19th century, starting in Germany and spread to some other areas, especially among Lutherans and Anglicans. The professionalization of roles such as nursing and social work in the early 20th century undercut its mission of using lightly trained amateurs. By the late 20th century secularization in Europe had weakened all church-affiliated women's groups, and the deaconess movement faded. The spiritual revival in the Americas and Europe of the 19th century allowed middle class women to seek new roles for themselves; they now could turn to deaconess service. In Victorian England, and northern Europe, the role of deaconess was socially acceptable. A point of internal controversy was whether that the lifelong vow prevented the deaconesses from marrying. While deacons are ordained, deaconesses are not. In World War II, diaconates in war zones sustained heavy damage. As eastern Europe fell to communism, most diaconates were shut down and 7000 deaconesses became refugees in West Germany. By 1957 in Germany there were 46,000 deaconesses and 10,000 associates. Other countries reported a total of 14,000 deaconesses, most of them Lutherans. In the United States and Canada 1550 women were counted, half of them in the Methodist churches. Lutheran pastor William Passavant was involved in many innovative programs; he brought the first four deaconesses to the United States after a visit to Fliedner in Kaiserswerth. They worked in the Pittsburgh Infirmary (now Passavant Hospital). Another more indirect product of Kaiserswerth was Elizabeth Fedde, who trained in Norway under a Kaiserswerth alumna, then established hospitals in Brooklyn, New York and Minneapolis, Minnesota (as well as provided the impetus for other hospitals in Chicago, Illinois and Grand Forks, North Dakota), although she turned down Passavant's invitation to administer his hospital. In 1884, Germans in Philadelphia brought seven sisters from Germany to run their hospital. Other deaconesses soon followed and began ministries in several United States cities with large Lutheran populations. In 1895, the Lutheran General Synod approved an order of deaconesses, defining a deaconess as an "unmarried woman" of "approved fitness" serving "Christ and the Church". It set up its deaconess training program in Baltimore. By the 1963 formation of the Lutheran Church in America, there were three main centers for deaconess work: Philadelphia, Baltimore, and Omaha. These three sisterhoods combined and form what became the Deaconess Community of the Evangelical Lutheran Church in America or ELCA. The Lutheran Church Missouri Synod (LCMS) also promoted the role of deaconess. The imperatives of the Social Gospel movement (1880s–1920s) led deaconesses to improve life for the new immigrants in large cities. In accord with the reform impulses of the Progressive Era, many agitated for laws protecting women workers, the establishment of public health and sanitation services, and improvement of social and state support for poor mothers and their children. Beginning in 1889, Emily Malbone Morgan used the proceeds of her published writings to establish facilities where working woman and their children of all faiths could vacation and renew their spirits. In 1888, Cincinnati's German Protestants opened a "sick house" ("Krankenhaus") staffed by deaconesses. It evolved into the city's first general hospital, and included a nurses' training school. It was renamed Deaconess Hospital in 1917. Many other cities developed a deaconess hospital in similar fashion. In Chicago, physician and educator Lucy Rider Meyer initiated deaconess training at her Chicago Training School for Home and Foreign Missions as well as editing a periodical, The Deaconess Advocate, and writing a history of deaconesses, Deaconesses: Biblical, Early Church, European, American (1889). She is credited with reviving the office of deaconess in the American Methodist Episcopal Church. In 1896 Methodist deaconesses founded the New England Deaconess Hospital to care for Bostonians, and the hospital added a staff of medical professionals in 1922. In 1996, the hospital merged with Beth Israel Hospital, which had opened in 1916 to serve Jewish immigrants, and thus formed the Beth Israel Deaconess Medical Center. Mennonites founded the Bethel Deaconess Home and Hospital Society for nursing education and service in Newton, Kansas, in 1908. Over the next half century, 66 Mennonite women served there. They were unmarried but did not take explicit vows of chastity and poverty. They worked and prayed under the close supervision of founder and head sister, Frieda Kaufman (1883-1944). With the growing professionalization of graduate nursing, few women joined after 1930. Canadian Methodists considered establishing a deaconess order at the general conference of 1890. They voted to allow the regional conferences to begin deaconess work, and by the next national conference in 1894, the order became national. The Methodist National Training School and Presbyterian Deaconess and Missionary Training Home joined to become the United Church Training School in 1926, later joining with the Anglican Women Training College to become the Centre for Christian Studies, currently in Winnipeg. This school continues to educate men and women for diaconal ministry in the United and Anglican churches. Between 1880 and 1915, 62 training schools were opened in the United States. The lack of training had weakened Passavant's programs. However recruiting became increasingly difficult after 1910 as young women preferred graduate nursing schools or the social work curriculum offered by state universities. In 1862, Elizabeth Catherine Ferard received Deaconess Licence No. 1 from the Bishop of London, making her the first deaconess of the Church of England. On 30 November 1861 she had founded the North London Deaconess Institution and the community which would become the (deaconess) Community of St. Andrew. The London Diocesan Deaconess Institution also trained deaconesses for other dioceses and some served overseas and began deaconess work in Melbourne, Lahore, Grahamstown South Africa and New Zealand. In 1887, Isabella Gilmore oversaw the revival of deaconesses not living in a community. 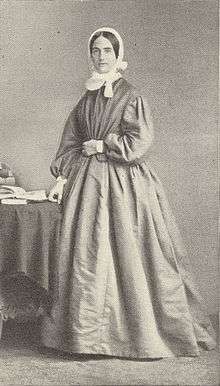 Lady Grisell Baillie (1822–1891) became the first deaconess in the Church of Scotland in 1888. She was commemorated in 1894 by the opening of the Lady Grisell Baillie Memorial Hospital in Edinburgh which was later renamed the Deaconess Hospital. Iglesia Ni Cristo's deaconesses are married women who devote themselves to the enforcing etiquette for women during worship services. ↑ Macy, Gary (2007). The Hidden History of Women's Ordination: Female Clergy in the West. Oxford University Press. 1 2 3 4 5 6 7 Karras, Valerie A. (June 2004). "Female Deacons in the Byzantine Church". Church History. 73 (2): 272–316. doi:10.1017/S000964070010928X. ISSN 0009-6407. ↑ Commentary on 1 Corinthians 9:5, Stromata 3,6,53.3-4. ↑ Commentary on Romans 10:17; Migne PG XIV col. 1278 A–C. ↑ I. Defarrari (ed. ), Saint Basil: the Letters, London 1930, Letter 199. ↑ Migne PG 62, col. 553. ↑ Migne PL 46, cols 988–990. 1 2 3 4 5 6 7 Olsen, Jeannine E. (1992). One ministry many roles: deacons and deaconesses through the centuries. Concordia scholarship today. St Louis: Concordia Publishing House. pp. 22, 25, 27, 29, 41, 53, 58, 60, 70. ISBN 0-570-04596-7. ↑ "Canons of the Council of Nicea". Womenpriests.org. Retrieved 2012-08-13. ↑ Apostolic Constitutions VIII, 19-20; F. X. Funk, Didascalia et Constitutiones Apostolorum, Paderborn 1905, 1:530. ↑ "The Ordination of Women Deacons/ Barberini gr. 336". Womenpriests.org. Retrieved 2012-08-13. ↑ Many texts are now online: "Grottaferrata GR Gb1 (1020 AD)". womenpriests.org. Retrieved 2011-04-21. ; "Vatican GR 1872 (1050 AD)". womenpriests.org. Retrieved 2011-04-21. ; and "Coislin GR 213 (1050 AD)". womenpriests.org. Retrieved 2011-04-21. ↑ R. Gryson, The Ministry of Women in the Early Church, Collegeville 1976; originally Le ministère des femmes dans l’Église ancienne, Gembloux 1972, esp. pp. 117–118; Y. Congar, ‘Gutachten zum Diakonat der Frau’, Amtliche Mitteilungen der Gemeinsamen Synode der Bistümer der Bundesrepublik Deutschlands, Munich 1973, no 7, p. 37–41; C. Vaggagini, ‘L'Ordinazione delle diaconesse nella tradizione greca e bizantina’, Orientalia Christiana Periodica 40 (1974) 145–189 ; H. Frohnhofen, ‘Weibliche Diakone in der frühen Kirche’, Studien zur Zeit 204 (1986) 269–278; M-J. Aubert, Des Femmes Diacres. Un nouveau chemin pour l’Église, Paris 1987, esp. p. 105; D. Ansorge, ‘Der Diakonat der Frau. Zum gegenwärtigen Forschungsstand’, in T.Berger/A.Gerhards (ed. ), Liturgie und Frauenfrage, St. Odilien 1990, pp. 46–47; A. Thiermeyer, ‘Der Diakonat der Frau’, Theologisch Quartalschrift 173 (1993) 3, 226–236; also in Frauenordination, W. Gross (ed. ), Munich 1966, pp. 53–63; Ch. Böttigheimer, , ‘Der Diakonat der Frau’, Münchener Theologische Zeitschrift 47 (1996) 3, 253–266; P. Hofrichter, ‘Diakonat und Frauen im kirchlichen Amt’, Heiliger Dienst 50 (1996) 3, 140–158; P. Hünermann, ‘Theologische Argumente für die Diakonatsweihe van Frauen’, in Diakonat. Ein Amt für Frauen in der Kirche – Ein frauengerechtes Amt?, Ostfildern 1997, pp. 98–128, esp. p. 104; A. Jensen, ‘Das Amt der Diakonin in der kirchlichen Tradition der ersten Jahrtausend’, in Diakonat. Ein Amt für Frauen in der Kirche – Ein frauengerechtes Amt?, Ostfildern 1997, pp. 33–52, esp. p. 59; D. Reininger, Diakonat der Frau in der einen Kirche, Ostfildern 1999 pp. 97–98; P. Zagano, Holy Saturday. An Argument for the Restoration of the Female Diaconate in the Catholic Church, New York 2000; J. Wijngaards, Women Deacons in the Early Church, New York 2002, pp. 99–107. ↑ H. Schlier, Der Römerbrief, Freiburg 1977, pp. 440–441 (full discussion); same view in the commentaries by Th. Zahn, Der Brief des Paulus an die Römer, Leipzig 1925; E. Kühl, Der Brief des Paulus an die Römer, Leipzig 1913; M.J. Lagrange, Saint Paul, Épître aux Romains, Paris 1950; F. J. Leenhardt, L’Épître de saint Paul aux Romains, Neuchâtel 1957; H.W.Schmidt, Der Brief des Paulus an die Römer, Berlin 1962; O. Michel, Der Brief an die Römer, Göttingen 1963; E. Käsemann, An die Römer, Tübingen 1974. Major article: G. Lohfink, "Weibliche Diakone im Neuen Testament", in Die Frau im Urchristentum, ed. G. Dautzenberg, Freiburg 1983, pp. 320–338. ↑ Novella 6. 6 par. 1–10; 131. 23; 123.30, etc. ; R. Schoell and G. Kroll, eds. Corpus iuris civilis, vol. III, Berlin 1899, pp. 43–45, 616, 662. ↑ Homily 11,1 On the First Letter to Timothy; Migne, PG 63, col. 553. ↑ In Epistolas b. Pauli Commentarii, ed. H. B. Swete, Cambridge 1882, vol. II, pp. 128–129. ↑ Jewette, Paul King (1980). The Ordination of Women: An Essay on the Office of Christian Ministry. Grand Rapids, Mich: William B. Eerdmans Publishing. pp. 70, 72. ISBN 0-8028-1850-1. ↑ France, R.T. (1997). Women in the Church’s Ministry. Grand Rapids, Mich: William B. Eerdmans Publishing. pp. 25, 85, 88. ISBN 0-8028-4172-4. 1 2 3 Torjesen, Karen Jo (1993). When women were priests : women's leadership in the early church and the scandal of their subordination in the rise of Christianity. San Francisco: Harper. pp. 10, 16. ISBN 0-06-068661-8. ↑ Wharton, Annabel (1987). "Ritual and Reconstructed Meaning: The Neonian Baptistery in Ravenna". Art Bulletin. 69 (3): 358–375. doi:10.2307/3051060. 1 2 Grenz, Stanley J.; Kjesbo, Denise Muir (1995). Women in the church : a biblical theology of women in ministry. Downers Grove, Ill: InterVarsity Press. p. 39. ISBN 0-8308-1862-6. 1 2 Swan, Laura (2001). The forgotten desert mothers : sayings, lives, and stories of early Christian women. New York: Paulist Press. p. 106. ISBN 0-8091-4016-0. ↑ Pat Thane; Esther Breitenbach (2010). Women and Citizenship in Britain and Ireland in the 20th Century: What Difference Did the Vote Make?. Continuum International. p. 70. ↑ Winter, "Deaconess", in Julius Bodensieck, ed. The Encyclopedia of the Lutheran Church p. 662. ↑ Frederick S. Weiser, "The Origins of Lutheran Deaconesses In America", Lutheran Quarterly (1999) 13#4 pp. 423–434. ↑ Laceye Warner, "'Toward The Light': Methodist Episcopal Deaconess Work Among Immigrant Populations, 1885–1910", Methodist History (2005) 43#3 pp. 169–182. ↑ Rosemary Skinner Keller et al., eds. (2006). Encyclopedia of Women and Religion in North America. Indiana U.P. p. 828. ↑ Pamela E. Klassen (2011). Spirits of Protestantism: Medicine, Healing, and Liberal Christianity. U. of California Press. p. 94. ↑ Ellen Corwin Cangi, "Krankenhaus, Culture and Community: The Deaconess Hospital of Cincinnati, Ohio, 1888–1920", Queen City Heritage (1990) 48#2 pp. 3–14. ↑ "Lucy Rider Meyer". United Methodist Church General Commission on Archives and History website. Accessed April 20, 2016. ↑ Rachael Waltner Goossen, "Piety and Professionalism: The Bethel Deaconesses of the Great Plains", Mennonite Life (1994) 49#1 pp. 4–11. ↑ "Deacons – Famous Deacons". DACE.org. Retrieved 2010-11-19. ↑ Henrietta Blackmore. The beginning of women's ministry: the revival of the deaconess in the nineteenth-century Church of England. Boydell Press. p. 131. ↑ "Scotland's First Deaconess", by D. P. Thompson, A. Walker & Son Ltd, Galashiels 1946. Ingersol, S. (n.d.). The deaconess in Nazarene history. Herald of Holiness, 36. Chisholm, Hugh, ed. (1911). "Deaconess". Encyclopædia Britannica. 7 (11th ed.). Cambridge University Press. p. 878.